Although it’s been up on YouTube for some eight months still one of the best introductions to Second Life, particularly for those in the health and medical fields, is the University of Michigan’s Health Sciences Libraries’ machinima highlighting Second Life and Public Health. The video, which I was again alerted to by SLED lister Patricia F. Anderson (pictured right – UMHSL emerging technologies librarian and longstanding head librarian for the UM Dentistry Library), shows Second Life as a virtual world through which an active public health community is simulating disaster scenarios, creating interactive health games, offering people with disabilities a place for support and social networking, and providing a space for professionals to view presentations and attend international conferences. The video gives a good overview in under five minutes without any major hype. It’s well worth watching. It is only one of a number of introductory Second Life health care videos on YouTube but is still probably one of the best. Chicken Little got it wrong! Surrounded by negativity!!! It’s frightening how the world of “yellow journalism” even if in its latest form of blogs permeates the thinking of otherwise sensible individuals. It’s right to take precautions to lessen the effects of the worldwide financial crash, swine flu, so-called, man-made climate change, the imminent collapse of Second Life, as some of the doomsayers, have been predicting, or for that matter the end of the real world – Got religion anyone? – but Chicken Little “sky-is-falling-in” news, like that created by tabloid bloggers of the Valleywag-Gawker variety – February publication – should be read in the same vein as the US rag, the National Enquirer. Valleywag-Gawker has been predicted the imminent demise of Second Life since 2006, if not longer. There are a myriad of constructive criticisms which can be thrown at Second Life and which are based on fact, but which often forget that Second Life, like the real world, is still under development and always will be by its very nature. As in the real world, it is being created, more often than not, by the choices we as Second Life residents make: that is the choices the majority of us who stay with Second Life make as interpreted by Linden Labs, rather than the choices made by the minority “wankers” who nevertheless stay with Second Life even though they whine continuously. However, for research purposes – particularly education research, it is probably the best, most practical, and most economic MUVE currently available for New Zealand ( and other Western World) residents, despite the problems with Broadband, which I lay at the door in New Zealand of our two major Telcos and the short-sightedness of the previous Government, a lack of Second Life stability (it is improving almost every day) and what is often seen as the dictatorial, totalitarian influence of the owners and creators, Linden Labs. One can either dip one’s toe in the water of Virtual Reality, as SLENZ and numerous other educational institutions and organisations are doing with Second Life, or be left behind: there is no doubt in my mind that MUVEs are becoming mainstream, and that Second Life and worlds like it are only the beginning. But, at the same time, I believe the drive for educational research results within Second Life and other Virtual Worlds should not be blurred by either attempting to move into time-consuming and expensive real-life replica developments which use all one’s research budget, or into negativity of the Chicken Little variety -sometimes the latter results from the first – when we are attempting to determine and measure the learning benefits in virtual worlds and how to make the most of the opportunities. That is not to say there are not numerous beautiful replica builds in Second Life which belong to educational institutions and others, but to me they have more to do with ego and sometimes branding, rather than actual educational outcomes. All the same they are still great to look at and if one cannot visit them in real life, a virtual visit is better than nothing. However, that long rant is not the basis of this blog. I’ve been cheered by the latest stats for the first quarter of 2009 from the Lindens and Second Life, even if one discounts the spin that is invariably put on company public relations releases. All the same they mirror my daily experiences in Second Life and my feelings about where Second Life is going after four years in-world almost on a daily basis. That is even though I often visit commercial sim developments where most of the stores are empty and avatars are few and far between and seldom seen. * 124 Million User Hours, an increase of 42 per cent from the same quarter last year. * Peak concurrent users of 88,200, an increase of 33 per cent from the same quarter last year. * 120M in user-to-user transactions, up 65 per cent from the same quarter last year. * The Island market has stabilized, although overall square meters of resident owned land has decreased, following changes in Open Land policy. * Gross sales on the Xstreet SL marketplace grew 23 per cent over Q4 of 2008 and 72 per cent over the same quarter last year. If you are in that negative place and wondering to which world you should turn this Linden blog is really worth reading. Yes, for the moment anyway, Chicken Little has it wrong! Second Life peak concurrency… *grin* No voice? Got lag? Get over it. Oldtimers will tell you it was once much worse. The UNAM Palace of Mining in SL .. and in RL. 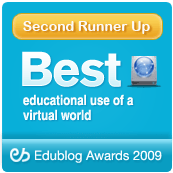 Despite the “tabloid” critics of Second Life and Virtual Worlds educational use of Second Life and other virtual worlds is becoming more and more mainstream, especially in the Open University environment. This growth has been strikingly demonstrated in world in world by creation of the virtual campus of the National Autonomous University of Mexico (UNAM), a school with more than 300,000 students and the largest university in Latin America. George Linden in the Second Life blog details UNAM’s current work on building its campus in Second Life for its Engineering School (11,000 students) Distance Education Programs and also its establishment of connections with companies in the real world to help take engineering design and training to the next level. “Developments began in November 2008 but a lot has happened in that short span of time,” Linden said, and that’s somewhat of an understatement. The UNAM’s main center in Second Life (slurl here but access limited) is built to look like the Palace of Mining, considered to be where science first set foot in the Americas. Here there are a wide range of projects including 3d demonstrations involving mathematics, robotics, and engineering, many with adjustable vectors (x, y, and z coordinates) giving hand’s one experience for students. In another area UNAM is using Second Life models to act as a visualization of and an interface for a real power world plant as in the machinima below. Terming the seven-page document “elegant” and “stylish” , Second Life guru and training video-maker Torley Linden (pictured) says that it is perfect for perusing and printing (to paper) either to prime your basic Second Life skills or getting started as the “noob” we all have been. The only problem is that Kiwis apparently only read instructions or how-to-do messages as a last resort be it assembling lawn mowers or clotheslines, joining a blog or downloading software. However, I would suggest that all educators should either print and distribute this “airplane info booklet” style Quickstart Guide to all their “noob” students before they move into Second Life as well as placing the link/pdf in their “Freebie orientation pack”. It could save tears later … or for the ‘not’so’noobs’ right now! While you are in the mood for learning you can’t go past Torley’s “learning to live in Second Life “ tutorial videos on YouTube. Those who attended the Virtual Journalism Conference at Washington State University last week may have glimpsed the future of global journalism in a brief documentary about an avatar-to-avatar news conference, according to Steve Kolowich, of The Chronicle of Higher Education. The news conference, which took place in February in Second Life, gave eight Egyptian political bloggers a chance to directly question James K. Glassman, the head of public-diplomacy under former President George W. Bush. The Second-Life news conference, according to Kolowich, was the final stage of a project, overseen by American University in Cairo and paid for by the US Agency for International Development, that brought the Egyptian bloggers to the United States to cover last fall’s presidential election. While some might dismiss a Second-Life meet-up as little more than a glorified conference call, Rita J. King, a former journalist, said the difference is tremendous. Ms. King is CEO and creative director of Dancing Ink Productions, which designed the virtual space where the news conference was held and also helped create the documentary. First of all, “teleconferences put people to sleep,” she told Kolowich. They’re also expensive. But most importantly, the experience of interacting in a three-dimensional space is much richer, sensationally and psychologically. The video archive of the conference is here while another interesting blog on change in journalism is here. OnLive has just begun promoting the beta version of a service (in the US only at this time) which should one day to allow the consumer to run even the most complex virtual worlds on entry level desktops. The game or MMORPGs run in a state-of-the-art OnLive game server center, ONLive claims, connecting an individual to game servers through the Internet, instantly sending your controller actions upstream and the results back downstream at blinding fast speeds. One wonders whether this will really deliver though especially into countries with third world Broadband coverage, like New Zealand.